I just back from wet market this morning. We did't have any breakfast only a cup of coffee this morning before going to market. My daughter so hungry. I should make easy and fast food for lunch. Even we have lot of things in our freeze. I won't do any special food. Because when people hungry they're easy to be angry. 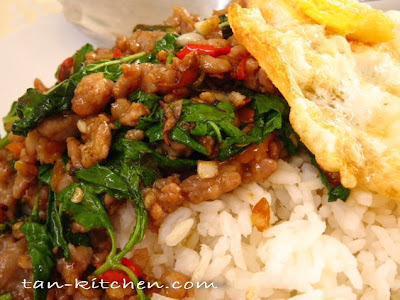 I should do "Pad ka-prao mou + khai dow" or fried ground pork with basil leave and fried egg. This is one plate dish. OK. let's see what I need. Heat a wok until the oil is hot, then stir in the garlic, and then add chillies. Stir another few seconds before adding the ground pork. Continue Stir-frying until pork is cooked throughly. Add onion and sprinkle black soy sauce over the mixture and stir-fry another 15-20 seconds. Then add fresh basil leaves and fish sauce to taste. Stir and mix well. Sprinkle with white pepper. Stir and transfer to a serving dish. 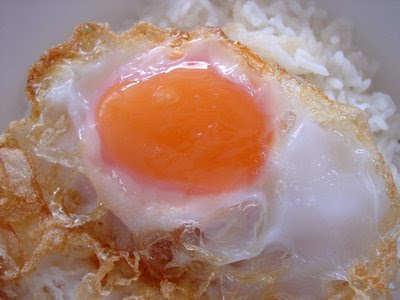 Normally, Thai people love to eat this dish with steamed rice and fried egg. This 2-3 serving. Tip: You can add more vegetables such as carrot, string bean, baby corn as extra ingredients.